We found L.A. Burdick Handmade Chocolates at the Dining by Design: Table Hop & Taste, and from then on, we’ve fallen deeper and deeper in love! You know how rarely we truly rave about products. 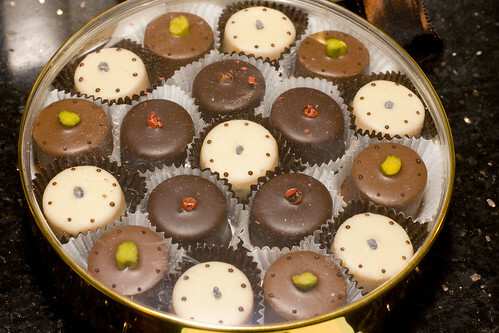 We’re a tough pair and it’s hard to impress us, but these are damn good chocolates. 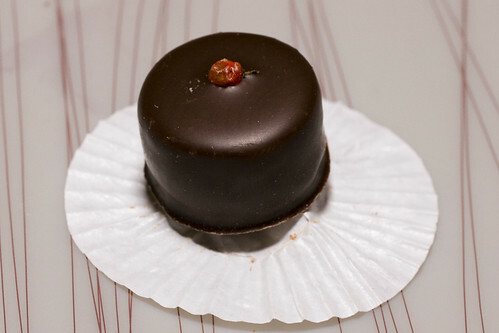 So while we’re finishing up the interview with Chef Michael Klug (coming very soon), we wanted to make sure we showed you some of their incredible Mother’s Day chocolates in time for you to order, because we know you’ll appreciate this. 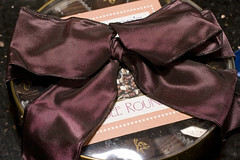 We got to try their two special Mother’s Day gifts, beautifully boxed and bowed. 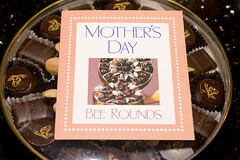 Bee Rounds is an adorable package with little handmade bees with almond wings. My mom couldn’t bare to eat the last bee, she loved it so much! The flavors in this box celebrate honey and roses without over-powering the chocolate. The Mother’s Day Chocolate Gateaux is just insanely good. Looking at the flavors, like Strawberry Violet and Grand Marnier Pistachio, I was a bit wary. I’m usually a chocolate purest, my favorite being around 72% dark, and find that most flavorings just distract or hide the chocolate. 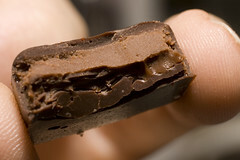 Lon and I (and all the lucky people we shared with) agreed that L.A. Burdick chocolates are the best in balance. The flavors really serve to enhance and each bite just makes you want to lay down and close your eyes to some soft music. As I sat there, gorging to my delight, I decided that L.A.Burdick is my permanent chocolate company from now on. 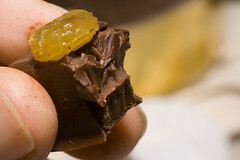 Besides being the best tasting chocolates, they’re made fresh without any preservatives, and they have great prices. It’s my favorite by far and I’m definitely joining their Connoisseur’s Club (with very tasty benefits). Stay tuned for our interview with Chef Michael Klug. posted by jessica	at 01:22 PM	Filed under Products. You can follow any responses to this entry through the RSS 2.0 feed. Both comments and pings are currently closed. I’m going to have to get my hands on a box of these chocolates very very soon. 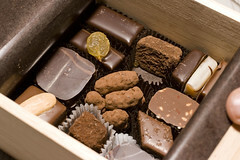 What a fantastic assortment of chocolates! Ice is welcome any time! So are the cute mice! 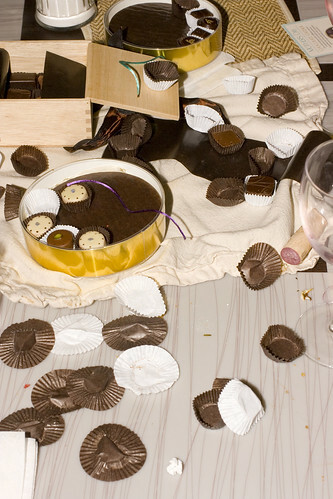 oh that looks like an INCREDIBLE assortment of chocolate! 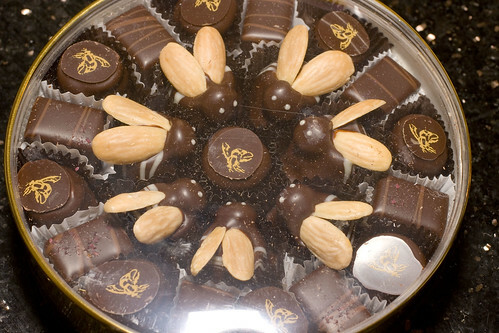 those bees are adorable and my mother LOVES almonds, so i think i know what to get her! Yeah, Burdick does great stuff. 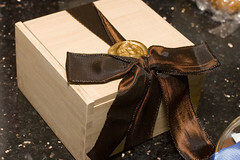 Their wooden gift boxes are great. The female half of this Duo gets to send them to clients sometimes for her job. Nice! I couldn’t agree more — I absolutely adore Burdick’s products. My wonderful husband gets me a small box for my birthday and Valentine’s Day. 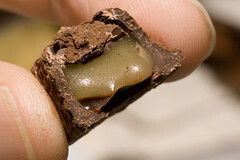 I love the petite little chocolates, each only 2 bites. Their flavors are so magnificent. I’m glad to see others agree! If you’re ever in Cambridge, MA they have a store in Harvard Square. You must get a cup of their hot chocolate. I Love Butter, great name! I would love to go to one of L.A. Burdick’s shops. I want to try everything they have! I agree the Apricot Ginger in Dark Couverture was incredible! 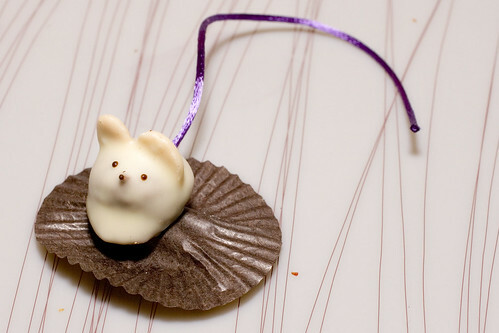 That was such wonderful chocolate! Mmmm. 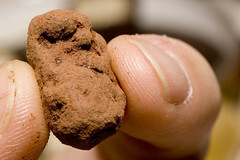 LA Burdick chocolate. They are so good. I like to eat those mice right off the string. Good thing you documented them, though. They always go way too fast, and then you think, Wow, shouldn’t 35 dollars last a little longer??? Hey this is the great article . Can one use any of it on my blog ? I would obviously link to your article so people could view the entire article if they wanted to. Thanks in either case.